Sailing the Mail in Alaska! "A captivating insight into Alaskan history." His photos appear in many books about Alaska’s history, mostly unsigned and unsung until now. This is the only biography of this productive but mysterious photographer: his life, his loves, and his great sense of humor during shipwrecks, volcanic eruptions, and on dogsleds delivering mail. Several adventures are quoted directly from his own unpublished manuscripts. Over 100 of his most famous photographic postcard images, plus never before published private family photographs of Thwaites himself, bring his life and times alive for the reader. The book is also illustrated with authentic period charts and maps of Alaska’s coasts from maritime archives. Indexed and richly footnoted, the book contains a large bibliography and an appendix listing the location of thousands of Thwaites’ photographs in various public and private collections. Author J. Pennelope Goforth has traveled the Alaskan coast from Adak in the Aleutian Islands, the Pribilof Islands, to Nome and Kotzebue in the Far North. She has been a crabber on the Bering Sea and been around Admiralty Island in a sailboat race. She lived aboard her own vessel in Juneau and Ketchikan in Southeast Alaska. Photographer, journalist, writer and editor, her photographs and writing have been published in many books, journals, newspapers, and magazines. Sailing the Mail in Alaska has become the NUMBER ONE bestselling Alaskan biography for 2003! Nominated for two national history awards, the book has garnered glowing praise for the stunning sepia-toned presentation of Thwaites' photographs. The book has been positively reviewed by many historical society newsletters in Alaska and Washington. Order your copy of Sailing the Mail in Alaska using your credit card and PayPal. Easy, secure and fast! November - TBA - Cook Inlet Books Anchorage, Alaska. Book signing with the cat SeaLegs and author Pennelope Goforth. October 7 - 1:30PM Seward Library, Seward, Alaska. Resurrection Bay Historical Society, Seward, Alaska. Presentation on SAdventures of the St.s DORA. October 7 - 3:30PM - Ranting Raven Bookstore, Seward, Alaska. Book signing. The cat SeaLegs may also be in attendance for pawprints on books. November 25-27 - Anchorage Museum of History & Art, Anchorage. Display of Thwaites' books and memorabilia during publishers book sale. October 8 10:15AM - Alaska Historical Society, Kodiak. Pennelope Goforth will present a paper Ship of Dreams, Islands of Hope: the SS DORA in Alaskan Waters. April 15 5:00PM - Baranov Museum, Kodiak. The collection of Thwaites' photograph at the Baranov Museum will be on display. The public is invited to view them with Pennelope Goforth as she discusses the historical meaning of his work and researching photographic collections. April 16 6:00PM - Kodiak Maritime Historical Society Annual Fundraising Dinner at the Elks Club featuring a five-course meal by Kodiak's Chef Joel Chenet and lecture, Sailing the Mail in Kodiak, by J. Penelope Goforth, author. Poetry by Mary Jacobs. Advance ticketing at Mill Bay Coffee. Tickets are $50 ($2/ticket go to Whale Fest). Contact: 486-0384. The cat SeaLegs has returned, refresed from her voyage, will be signing books again soon with author Pennelope Goforth! Check back for details! September 17, 10:30ish AM - Anchorage Museum of History & Art, Anchorage. Pennelope Goforth will present a slide show on The Life & Times of John E. Thwaites and His Boat, the SS DORA. This historical presentation is hosted by Museums Alaska and the Alaska Historical Society. Book signing to follow. The cat SeaLegs will not attend, being on a brief voyage this month to the island of Felinity. May 29, 2004 1:00PM - Alaska SeaLife Center, Seward. Author Pennelope Goforth and the cat SeaLegs will present a reading from Sailing the Mail in Alaska . 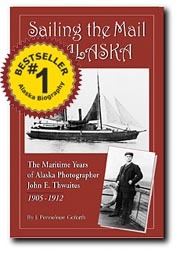 She will share interesting tidbits of Thwaite's life in Seward from her research and sign books. May 8, 2004 - 1:00PM - Alaska Museum of History and Art. Author Pennelope Goforth will sign books. November 20, 2003 1:00PM - FishExpo at the Washington Convention Center. Author Pennelope Goforth will sign books and BS with fishing industry friends. October 25, 2003 12:00 Noon - 5:00PM - Book Bonanza at the Cottonwood Creek Mall in Wasilla. SeaLegs and Pennelope join other Alaskan authors for a great book signing frenzy and fun! August 18, 2003 4:00-6:00PM - Hearthside Books Downtown Juneau Store. Author Pennelope Goforth will sign books and relate tales from the travels of John E. Thwaites. August 9, 2003 12:00 Noon - 2:00PM - Valdez Museum Store. Author Pennelope Goforth and the cat SeaLegs will sign books and relate tales from the travels of John E. Thwaites. They will also narrate a historical presentation on August 8 at the museum from 5:00PM to 7:00PM. FMIC Tabitha Gregory 907.835.2764, Valdez Museum Store 217 Egan, Valdez, Alaska. June 12, 2003 5:30 to 6:30PM - University of Alaska Anchorage Bookstore in Anchorage. Author Pennelope Goforth and author Amy Mayer who has just finished a cd about environmentalist Celia Hunter called "Celia's Alaska: Pioneer Stories of Denali" will do a joint historical presentation on their books. May 10, 2003 1 - 3:00PM - Fireside Books in Palmer. Author Pennelope Goforth signs books and relate tales from the travels of John E. Thwaites. April 16, 2003 7:30PM - Barnes & Noble in Anchorage. Author Pennelope Goforth and the cat SeaLegs sign books and relate tales from the travels of John E. Thwaites. April 8, 2003 7:30PM - Title Wave Books in Anchorage. 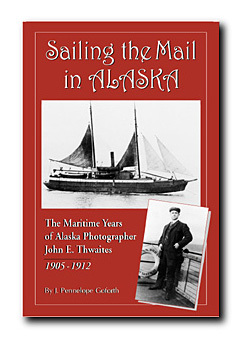 Author Pennelope Goforth presents a lively historical presentation on photographer John E. Thwaites and his career photographing coastal Alaska.